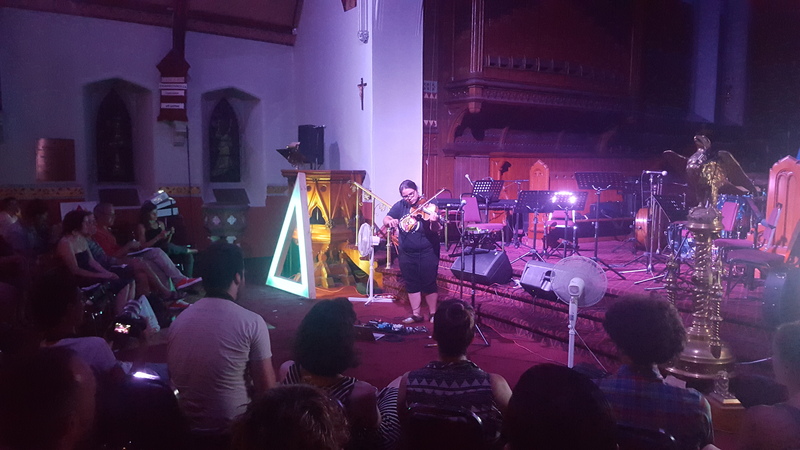 The Queer Songbook Orchestra made the extreme heat in St. Alban’s Church very bearable as they delivered a powerful performance to kick of this year’s Arboretum Festival. The 11-piece chamber ensemble were stellar in their first performance outside of their hometown of Toronto. They are not your typical cover band. They take a look back at the last one hundred years of popular songs with focusing on songs of importance to the queer community, and revealing the backstories and personal narratives behind much of this music. They don’t just play the song, they re-envision the music with all new interpretations of the material from many of Canada’s top composers. And to top it all off, the Queer Songbook Orchestra have speakers present a narrative before every song explaining the song and artist’s backstory which really brings the song to life. On this night the narratives were delivered by locals Lawrence Aronovitch, Luna Allison, and Rob Friday. Their set featured more modern songs like The Smith’s “Please, Please, Please, Let Me Get What I Want”, k.d. lang’s “Constant Craving“, and Melissa Ethridge’s “Come to My Window”. They also dug deep with songs such as Lesley Gore’s “You Don’t Own Me“, Billy Strayhorn’s “Lush Life”, and Lorenz Hart’s “Blue Moon“. Vocals were primarily delivered by the charismatic Alex Samaras, as well as local stand-in and the incredibly talented Alanna Stuart. A highlight for me was when they ventured into the Disney catalogue and played The Little Mermaid‘s “Part Of Your World”. Oh and did I forget to mention they ended the night with a rendition of Taylor Swifts’ “Shake It Off“? The performance and the stories were powerful, inspiring – I am still in awe. The Queer Songbook Orchestra is not to be missed. For everyone in Toronto it is a must see and for everyone outside of Toronto start trying to convince them to come play your town. It’s also important to mention that the Queer Songbook Orchestra are partnered with the Canadian Lesbian and Gay Archives, the largest independent LGBTQ archives in the world. And as trumpet and flugelhorn player Shaun Brodie said, “This project is about the community, we are always looking for stories and songs that hold importance to you. We would love to hear from you.” If you would like to contact them, you can reach them via facebook, twitter or info@queersongbook.com. Melody McKiver performing at St. Alban’s Church during Arboretum 2015. Opening the night was Anishinaabe viola player extraordinaire, Melody McKiver. She started with two originals making excellent use of looping pedals and had me captured right. Then she took it up a notch. There is something truly special about watching projected short films as someone performs the soundtrack live. The films, which were projected on the church wall and presented by the Asinabka: Aboriginal Film and Media Arts Festival, were Edmazinbiiget by Christian Chapman and The Big Lemming by Mosha Folger. It was a facinating experience I want to be a part of again. Arboretum continues from now until Saturday. For more information check out www.arboretumfestival.com/ and look them up on facebook to stay in the loop.